I’m back home now, after a long week and a half in Venice. It was a wonderful and tiring trip. The last few days were a blur of visiting exhibitions, meetings and trying to squeeze in a few culinary adventures. On my second last night, one of my bosses asked me to organize a (thank you) dinner for our team–20 persons strong–in Venice. I booked two tables at Fiascheterria Toscana, a very well-known seafood restaurant near the Rialto bridge. We planned a yummy four course meal consisting of raw tuna wrapped in ricotta and a spinach crepe; squid ink tagliatelle in lobster sauce; sauteed John Dory with fried chanterelles; and Tiramisu. White wine, coffee, and water were included. The first two courses were knock-outs, especially the pasta (pictured above). The Tiramisu was good, if a tad sweet, but the John Dory was a bit overcooked. My last night in town, I went with four colleagues to another well-known seafood restaurant, Trattoria Alla Madonna. (This was after having a lovely, slightly boozy lunch back at Ostaria Boccadoro–which I really love.) This was my second visit to Alla Madonna and it was just like the first, noisy, busy but serving good food at prices much more reasonable than the canal-side restaurants just a few steps away. I had a crabmeat tossed in olive oil and lemon juice (pictured above), followed by cuttlefish cooked in a squid ink sauce with polenta, and then fragolini with vanilla ice cream (super-delicious). Before I left, I knew I had to find some great stuff to share with my wife. I had gone looking for some wine a couple days earlier, but the wine store I usually visited (Mille Vini) was out of all the wines that I was looking for. Fortunately, just the day before I left, I discovered a fabulous wine store, with–according to the owners–the best wine collection in Venice. And, from what they had available, I tend to believe them. While all the other storekeepers I asked about Quintarelli Valpolicellas or Amarones either shook their heads or laughed at me, Mascari had a healthy stock of both. They also had Romano Dal Forno Amarone and many other wines by great cult Italian winemakers. I picked up a Quintarelli Valpolicella and a Multipucliano D’Abruzzo Rose wine that the storekeeper claimed was the best in Italy. I also stopped off at a great butcher, Aliani, around the corner from Mascari, and picked up some San Daniele Prosciutto and some fabulously fatty Pancetta. I plan to enjoy the wine and the meats in the very near future. How lovely of you to think of your dear wife while away! Those treats sounds to die for, and I look forward to the review of the wines. I adore Valpolicellas, so am especially interested. Actually, I bought two bottles of the Quintarelli and opened one with my colleagues in Venice. It was super, as Quintarelli’s wines always are. It was full-bodied, slightly sweet, with a satiny finish. It was a 1997, one of the better recent vintages in Veneto. If you get a chance, do try to find his wines, especially the Amarone (which unfortunately costs almost 4 times as much as the Valpolicella). It’s super-dense, almost a dessert wine, but to me the best example of a great Amarone on the market today. 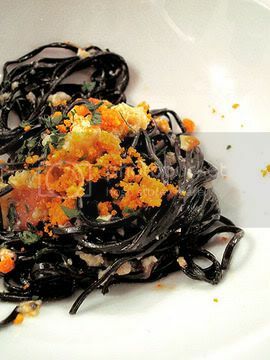 That squid ink tagliatelle in lobster sauce looks and sounds amazing! So does that pancetta… it's making me drool. Can't wait to hear about what you make with it! The tagliatelle was amazing. 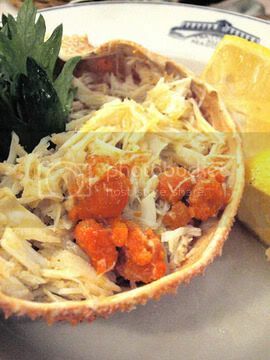 If only lobster was cheap enough so I could experiment with recreating that sauce. 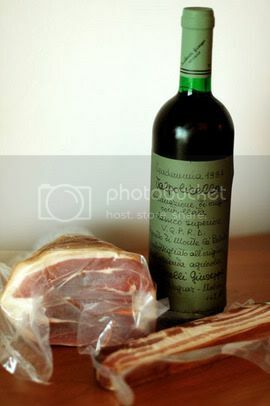 Haven’t yet decided what to make with the pancetta. Was thinking of Carbonara with homemade pasta, but would that be a waste? An old lady in the butcher shop told me I should slice it thin and steam it with potatoes. What do you think? Gorgeous photos. You are making me hungryx3.